Most of our marketing and outreach efforts are targeted towards Customer Success and Support roles, who often really want our product, but have no way of installing it without the help of their dev team. We’ve always relied on them to seek help with installation, but almost half did not have Upscope installed after one month. A simple change to our interface and emails we sent out cut that number in half. Before implementing the change, we didn’t think about how a larger company actually operates. 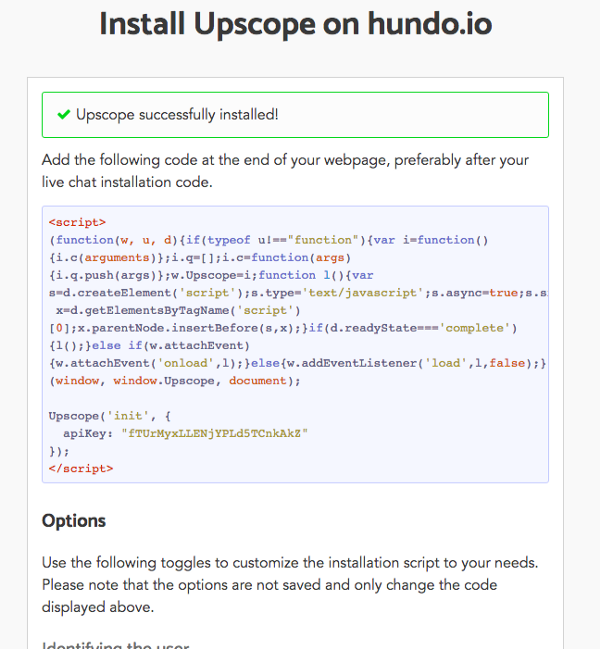 The user would sign up and be taken to a page with the code to install on their website, without many instructions. At the top of the page we pointed out that they could share the page with their dev if needed, but it clearly wasn’t loud enough. Where we really messed up were the emails: over the course of 3 weeks, we’d send around 5 emails to new sign ups that did not install the software. All the emails were reminders that they’d need to install the software, and we kept asking them why they hadn’t done it yet. The problem with this is that we were talking to the wrong people. Our users were never going to install the software themselves, so there was another conversation between them and their developer which we had no control over. That needed to change. The first change we made was in the UI. 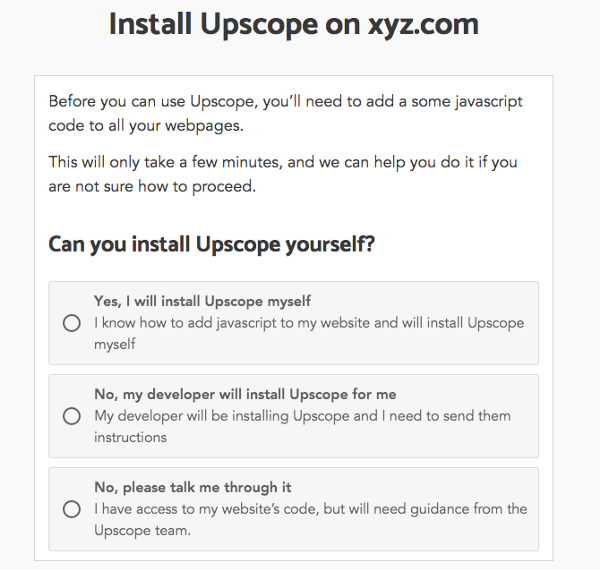 After sign up, new users are now asked with a question: Can you install Upscope yourself? If they answer “Yes”, we show them the regular installation widget with the code. If they answer “No, please talk me through it”, we let them ask us questions or schedule a phone call with a member of our team (through an embedded calendly). This is where it gets interesting: instead of prompting them to install it, we prompt them to tell their developer to install it. To do this, we include a huge button in all emails that lets them send their developer an email with one click. On top of that, we automatically cc ourselves in that email so that we can answer developer questions directly and be on top of things. The email that the button generates is signed off with our user’s name, and includes a link with the instructions for installation for their specific company (no log in necessary). Allowing our users to easily reach out to their developers with a pre-formatted message has almost halved the number of sign ups that never install our software. The best part is that this result is not driven by trying to persuade our users to do something they were resisting, but by helping them take the next step (contacting their developer) without having to think about what to write, and without having to plug their developer’s email into our app. It’s very easy to guess why option 1 doesn’t work very well. It makes the user think about what to write, and it’s very easy for them to put it off until later. A lot of people, myself included, wouldn’t be comfortable adding a colleague’s email in another company’s website as I don’t know how it will be processed. Will I be able to customize the email? Will they send them more than one email? You’ll never know. mailto: works great, however. There’s no thinking on the user’s part, it’s immediate, and it doesn’t require them sharing their colleague’s email with your company. The best thing is that they can even be included in emails you send them, which means they’d click it when their email software is already opened and it would literally take them five seconds to send the email. On top of that, you can cc yourself in the email so that you automatically join the conversation. There are many tools out there that let you create mailto links, but they often don’t work for intercom because they will encode the brackets needed for custom attributes. Do you have Intercom tips and tricks to share with us? Send us an email at team@upscope.io! Learn more about Upscope at upscope.io. 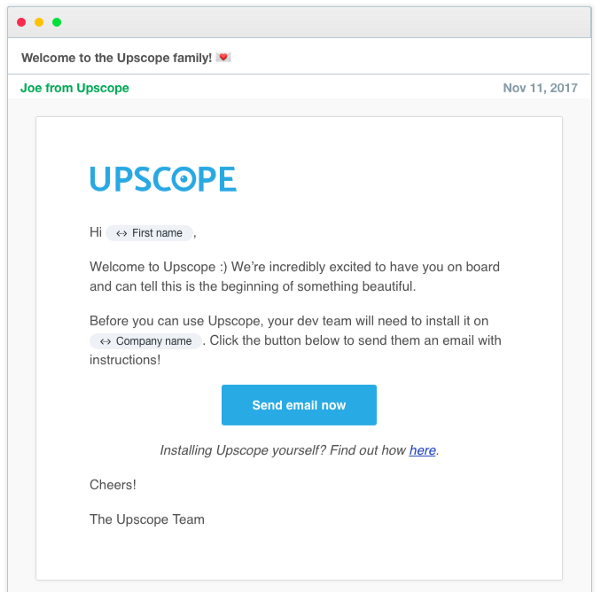 See a full Intercom email drip campaign you can use as a template to see how Upscope onboards, educates and retains users. Note: These templates are from just before the update mentioned above.